A partnership with the University of Minnesota Landscape Arboretum led to an amazing French-inspired greenhouse. In May of 2018, our owner Jim Hewitt (Owner of Conservatory Craftsmen) and his wife Mary Jo took a trip to London to attend the annual Chelsea Flower Show. It is a multi-day, immensely popular show – and it inspired us here at Conservatory Craftsmen to design this year’s glass building for the Passport to Spring show at the UofM Landscape Arboretum. 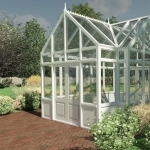 This new free-standing greenhouse is modeled after the European kitchen-gardens we were so inspired by over in England. And in particular, fits well into a Traditional French garden design. This structure will be on display for the duration of the Passport to Spring show, February 1st – March 3rd, 8:00 a.m. – 4:30 p.m (Monday-Saturday) and 10:00 a.m. – 4:30 p.m. (Sunday).